Intel may release Core i9 Processors to compete against the AMD Ryzen processors and their upcoming processor line. 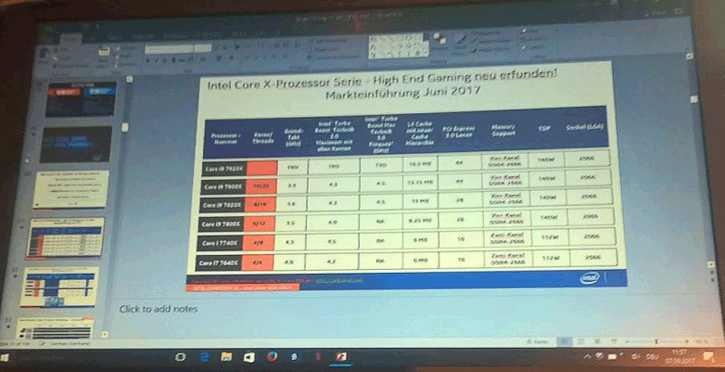 Intel’s top of the line flagship model will be a Core i9 7920X, this processor will feature a 12-core with 24 threads. AMD will release 16-core / 32 threaded Ryzen Whitehaven processors. According to the leaked photo of an internal powerpoint presentation, Intel Core i9 processors are going to support quad-channel memory at 2667 MHz and will get a 160 Watt TDP, a maximum 16.5 MB L3-cache and 44 available PCI-Express lanes for inter -connectivity. The company may announce this new processor line in June. It is also stated that the top flagship Core i9 7920X will be available as late as August. Please do take all these leaks with a grain of salt.